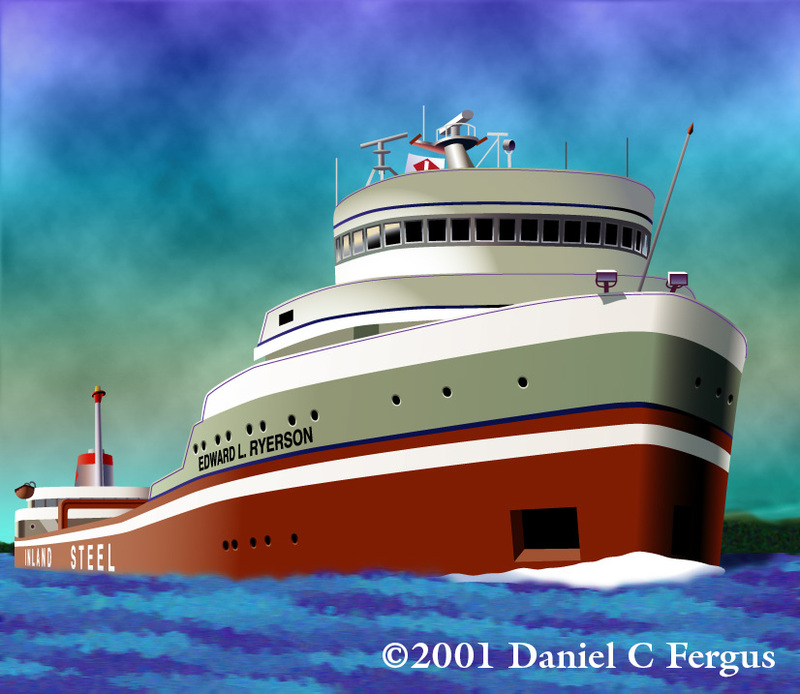 The Edward L. Ryerson is an actual Great Lakes ore freighter. I’m a bit of a boat nerd; I especially love classic Great Lakes freighters, which are easily recognized thanks to a unique feature—they have a stack of cabins and the pilot house in the bow of the ship (as opposed to the stern). The forward-positioned pilot houses made it easier to navigate the narrow and twisting rivers and canals that connect the Great Lakes and lead to inland ports. But alas, this classic configuration will soon become extinct; modern navigational technology has removed the need for the bow pilot house, so shipping groups are able to build and/or purchase vessels built with the more common stern pilot house design seen everywhere else in world. The last freighters built with bow cabins entered service nearly fifty years ago, and every year a handful of the oldest classic ships are sent to the scrapyard. There are only about two dozen such vessels still in service on the Lakes, truly a dying breed.